The surviving machine gun emplacement (pillbox) was built in 1942-43 as part of New Zealand’s coastal defences. The NZ Army and Home Guard kept watch from this and other nearby pillboxes for enemy forces arriving at Porirua Harbour. Machine gun emplacements were miniature forts constructed with reinforced concrete. These structures were originally developed by the German army during WWI to house gunners and strengthen trenches along the battle line at Ypres and Messines. Their very thick walls made them difficult to destroy with artillery barrages. 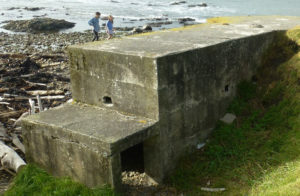 When the British began building similar machine gun emplacements during WWII, they became known as ‘pillboxes’ because of their resemblance to tablet boxes supplied by chemists. With the increased threat of a Japanese invasion after the attack on Pearl Harbour in December 1941, the model was adopted by the New Zealand Army and Home Guard. 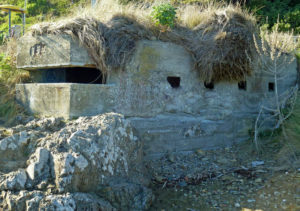 Over the next two years about 340 pillboxes were built at strategic points around New Zealand’s coastline including 38 in the Wellington region. They varied in style and size, and were spartan and often cramped. Some had internal concrete shelves and tables to support weapons and were whitewashed inside. The Porirua Harbour was seen as a potential landing spot for invading forces approaching Wellington. Ngāti Toa Domain was taken over for a military camp, first by New Zealand forces and later the United States troops. As part of the defences, pillboxes were built around the Plimmerton coastline. Two remain at the south end of Plimmerton Beach. They were built between 1942 and 1943, at the same time as one behind the Plimmerton Boating Club, and seven others dotted along Karehana Bay, Plimmerton Beach and further south along the coast. Remains of pillboxes can also be found at Titahi Bay and Pukerua Bay. The surviving Plimmerton pillboxes are an ‘arrowhead’ type built with 300mm thick reinforced concrete walls and roof. A door was set into the end of each wing. Each pillbox was designed to hold eight men. The head had a slit for the machine gun and firing ports were located on each wing as well as over the doors. These ‘openings’ were originally covered with heavy steel baffle plates which are now missing. The arrangement provided a good line of sight around the pillboxes. The plan was for the local Home Guard to be the first line of defence if enemy forces appeared in the harbour. Only one of Plimmerton’s two existing pillboxes can be easily seen today. It is built into a spur of rock below the railway line. The right side shows the gun ports; the left side is obscured by a sand dune and the roof is covered with grass. The other pillbox peeps out from under the walkway about 40 metres nearer Plimmerton beach. 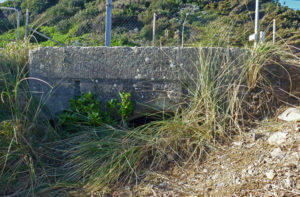 The second pillbox under the walkway south of Plimmerton Beach.